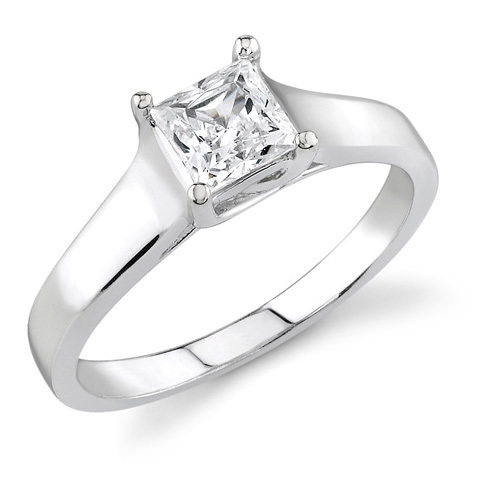 A single princess cut diamond solitaire set in a 14k white gold cathedral style setting. 1/3 Carat Total Diamond Weight (0.33 Carat). Available in 1/4 Carat, 1/3 Carat, 1/2 Carat, 5/8 Carat, 3/4 Carat, and 1 Carat (by request). Also available in yellow gold (shown below), or in platinum by request. Apples of Gold Jewelry guarantees the 1/3 Carat Cathedral Princess Cut Diamond Engagement Ring, 14K White Gold to be of high quality and an authentic engagement ring with real diamonds, as described above.